Location: Archives 058, VF/Byzantine Studies, Vasiliev, Alexander A. Acquisition Information: These papers came to Dumbarton Oaks from various sources at various dates. Processing Information: The papers were processed by James N. Carder in 2013. Preferred Citation: Alexander Alexandrovich Vasiliev Office Papers and Related Materials, Dumbarton Oaks Archives. Courtesy of Dumbarton Oaks Research Library and Collection, Washington, D.C.
Alexander Alexandrovich Vasiliev (Александр Александрович Васильев) (1867–1953) was considered the foremost authority on Byzantine history and culture in the mid-20th century. His History of the Byzantine Empire (vols. 1–2, 1928) remains one of a few comprehensive accounts of the entire Byzantine history. Vasiliev studied under one of the earliest professional Byzantinists, Vasily Vasilievsky, at the University of St. Petersburg and later taught the Arabic language there. Between 1897 and 1900, he continued his education in Paris. In 1902, he accompanied Nicholas Marr on his trip to the St. Catherine Monastery in the Sinai. During his stay at the Tartu University (1904–1912), Vasiliev prepared and published an influential monograph, Byzantium and the Arabs (1907). He also worked in the Russian Archaeology Institute, established by Fyodor Uspensky in Constantinople. In 1912, he moved to the St. Petersburg University as a professor. He was elected to the Russian Academy of Sciences in 1919. In 1925, during his visit to Paris, Vasiliev was persuaded by Michael Rostovtzeff to emigrate to the West. It was Rostovtzeff who ensured a position at the University of Wisconsin, Madison, for him. Several decades later, Vasiliev moved to work at Dumbarton Oaks, where he was a Senior Scholar between 1944 and 1948 and thereafter a Scholar Emeritus. Towards the end of his life, he was elected President of the Nikodim Kondakov Institute in Prague and of the Association Internationale des Etudes Byzantines. Biography: Milton V. Anastos, “Alexander A. Vasiliev: A Personal Sketch,” The Russian Review 13, no. 1 (January, 1954): 59–63; Sirarpie Der Nersessian, “Alexander Alexandrovich Vasiliev, 1867–1953,” Dumbarton Oaks Papers 9/10 (1956): 1–21; and Ionut Alexandru Tudorie, "Alexander Alexandrovich Vasiliev (1867-1953): The Patriarch of the Byzantine Studies," Byzantino-Slavica, Revue internationale des études byzantines 70, nos. 1-2 (2012): 283-323 [contains Vasiliev bibliography]. The Alexander Alexandrovich Vasiliev Office Papers and Related Materials contain his correspondence, notes, newspaper photocopies, summaries, a medal, and journal articles about him. The Dumbarton Oaks Archives also has holdings of Vasiliev’s research papers and photographs. Item 1 (2 pages): "Biographical Information for the Wisconsin Union's Faculty Portrait Collection," photocopy. Item 2 (1 page): "A.A. Vasiliev, Scholar in Resident at Dumbarton Oaks, 1945-1946," manuscript list of accomplishments. Item 3 (2 pages): "A. Vasiliev's Work in 1945-1946," photocopy of typescript and script. Item 4 (2 pages): "A. Vasiliev's work in 1947-1948," typescript and script. Item 5 (2 pages): Correspondence from Alexander A. Vasiliev to A. M. Friend and John S. Thacher, March 29, 1951, script, re: paid leave of absence. Item 6 (1 page): Correspondence from Alexander A. Vasiliev to Robert Woods Bliss, April 9, 1951, script with annotation in another hand, re: leave of absence statement. 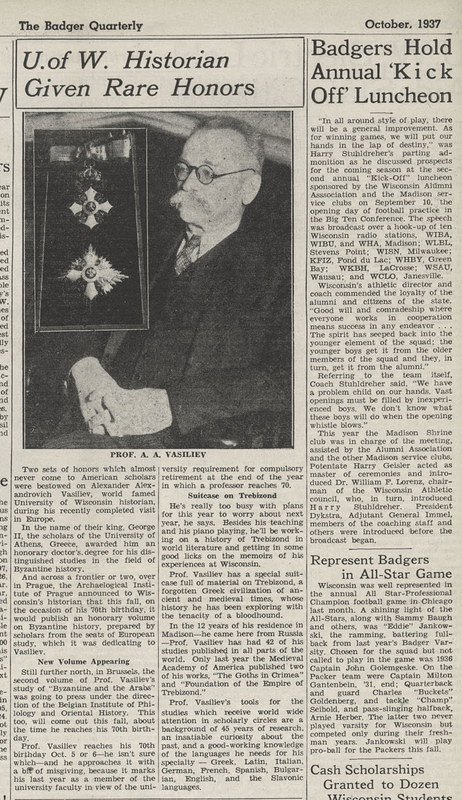 Item 7 (1 page): The Badger Quarterly (October 1937), "U. of W. Historian Given Rare Honors," newspaper clipping with image of Vasiliev. Item 8 (1 page): Press release from the University of Wisconsin News Service, Madison, Wisconsin, November 10, 1952, re: English publication of Vasiliev's The History of the Byzantine Empire. Item 9 (2 pages): "Memorial Resolutions of the Faculty of the University of Wisconsin on the Death of Emeritus Professor A. A. Vasiliev," document 1085, October 5, 1953, photocopy of typescript with script annotations. Item 10 (1 page): Photocopy of photograph image of Vasiliev, undated. Item 11 (1 page): Processing sheet for Vasiliev Papers, University of Wisconsin, Madison, College of Letters and Science, Department of History, incomplete except for May-July, 1925. Item 12 (6 pages): Print of electronic copy of Milton V. Anastos, "Alexander A. Vasiliev: A Personal Sketch," Russian Review 13, no. 1 (January, 1954): 59-63. Item 13 (42 pages): Print of pdf copy of Ionut Alexandru Tudorie, "Alexander Alexandrovich Vasiliev (1867-1953): The Patriarch of the Byzantine Studies," Byzantino-Slavica, Revue internationale des études byzantines 70, nos. 1-2 (2012): 283-323 [contains Vasiliev bibliography]. 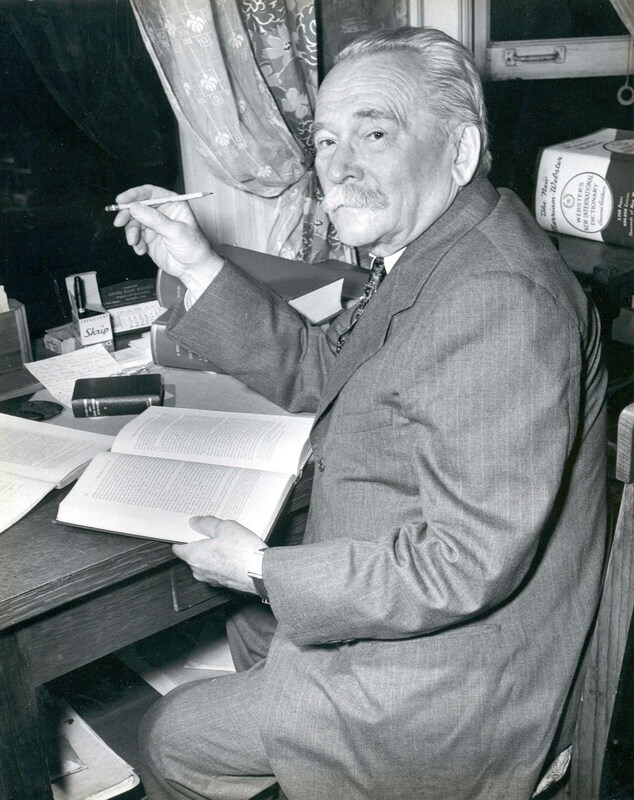 Item 1 (1 photograph): Image of Alexander Alexandrovich Vasiliev seated at a desk with an open book, Dumbarton Oaks Archives, AR.PH.Misc.091. 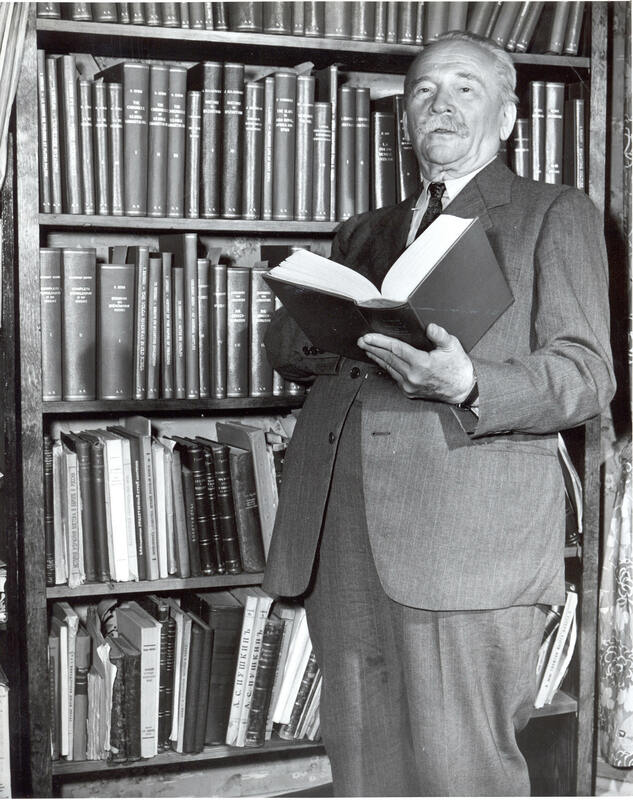 Item 1 (1 photograph): Image of Alexander Alexandrovich Vasiliev standing in front of a bookcase, Dumbarton Oaks Archives, AR.PH.Misc.092. Item 1 (1 photograph): Image of Alexander Alexandrovich Vasiliev, bust length, Dumbarton Oaks Archives, AR.PH.Misc.208. Item 1: Bulgarian Badge (pendant) of the Royal Order for Public Merit, Second Degree, ca. 1934. Item 2: Bulgarian Badge (pin) for the Royal Order for Public Merit, Second Degree, ca. 1934. [The Civil Merit set consists of two badges, one suspended from the Bulgarian royal crown and attached to a grosgrain neck ribbon and the other a pin. Each badge is of enameled silver-gilt and has a white cross with oak leaves and acorns between the arms. The pendant badge is double-sided. One side has a red circular medallion with the monogram ФI for King Ferdinand I, who instituted the Order. Bordering the monogram is a white ring inscribed: ЭА ГРАЖДАНСКА ЗАСЛУГА (“for Civil Merit”) and a star signifying the second class of the order. The reverse side has a red circular medallion depicting the Bulgarian lion rampant with a shield of the Saxon coat of arms on its breast. The white bordering ring is inscribed with the date: 2 ABГУCTЪ 1891 (“2 August 1891”), the date the order was first issued. The Royal Order for Civil Merit was conferred on Bulgarian civilians and, rarely, others for exemplary service or acts of merit that warranted the gratitude of the country.